Being that I live in Hawaii where we don't have a true "fall" season, it is REALLY difficult to find autumn/fall themed paper! I went to an LSS and got the very last sheet of this cute patterned paper. The great thing is that it is two-sided, so I really only needed one sheet of paper to get two different patterns. 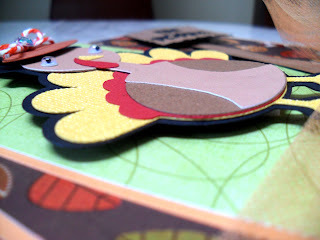 For the diecut, I turned to my trusty Cricut E and the Create a Critter cartridge for this cute turkey. 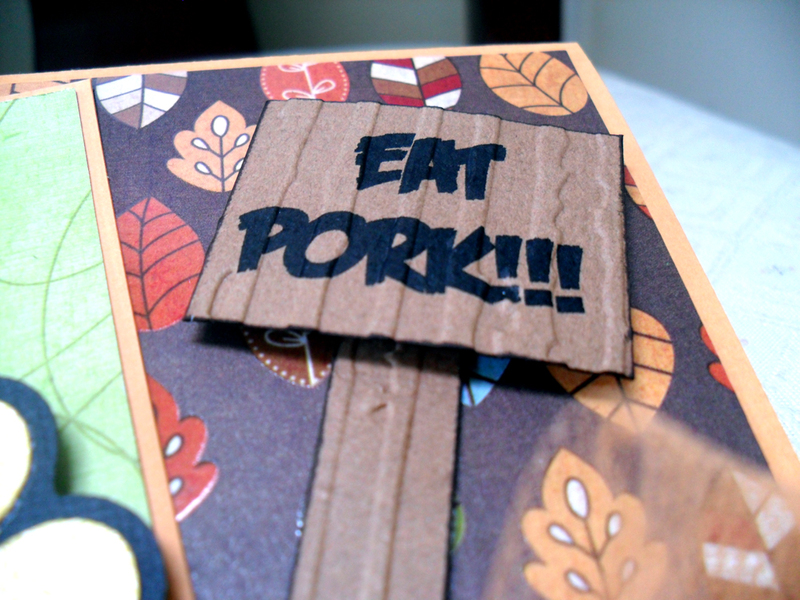 I love using Googly eyes for a whimsical touch to diecuts. I also dressed up the turkey's hat with some mandarin twine from The Twinery and some bling. Orange tulle and and brown ribbon were the second and third trims used on my card. I knew that I wanted to do something fun with this card, so I used a computer-generated sentiment. If the font looks somewhat familiar, it's because it's the one associated with a game that is all the rage (no pun intended) right now: Angry Birds. LOL! I printed the sentiment on brown cardstock and then embossed with a Cuttlebug folder I recently bought. I was so excited to be able to use it! It's hard to see, but I did ink the sign with Tim Holtz Walnut Stain Distress Ink. I also pop-dotted the top part of the sign. Here is another view of the turkey to show how I pop-dotted the turkey. I love dimension on my cards! I really had fun with this card. So far, it's my favorite DT project for FGCB. 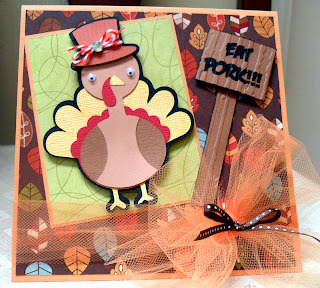 Please be sure to check out the challenge and try your hand at our Thanksgiving recipe. that turkey is just way too cute! Super cute card! Love that turkey, adorable! I love it! Too cute and super funny. Great card. wow! this is such a great card! Thanks for sharing it with us at DCD. Oh this is too cute. Love the tulle.Thanks for joining us at DCD. Glad to be able to "Showcase" your turkey this week at Die Cuttin' Divas.